Last year the Juno spacecraft made a close approach to Earth. Such near-Earth flybys are used by spacecraft to give them a boost of speed needed to reach the outer planets. The initial launch of Juno only gave it enough speed to reach a bit farther than the orbit of Mars, so its orbit was aimed to come close to Earth. As it approached Earth from behind, Earth’s gravity gave it a boost of speed (at the cost of slowing Earth down very slightly). Juno thus gains enough speed to reach Jupiter. The main purpose of the flyby is simply to get the spacecraft to Jupiter. But a close flyby of a spacecraft is a rare thing, so it is worth taking advantage of. Amateur astronomers have imaged the spacecraft during close approach, Juno itself took some images of the Earth and Moon during the flyby. But perhaps the most interesting data is about Juno’s speed and trajectory after the flyby. 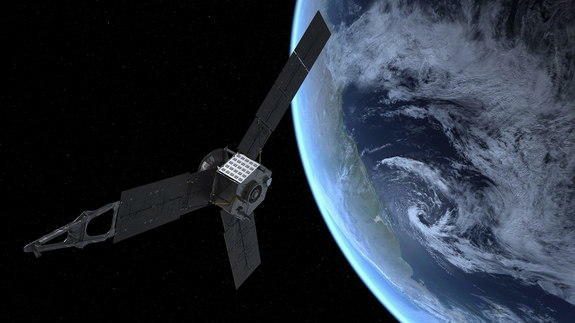 Some spacecraft that make a close flyby of Earth seem to gain slightly more energy than they should. 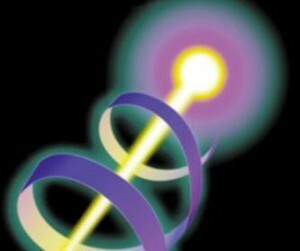 This extra energy is very small, giving it a speed millimeters per second faster than predicted. Given that the typical speed of a spacecraft at flyby is on the order of 10 kilometers per second, this difference is tiny. But it has been observed, and it called the flyby anomaly. The anomaly was first observed in the flyby of Galileo in 1990, when careful measurements of its Doppler shift revealed an extra speed of 4 mm/s. On Galileo’s second flyby in 1992, no anomaly was observed. In 1998 NEAR gained 13 mm/s. Cassini had no anomaly in 1999, Rosetta had an anomaly in its 2005 flyby, but not in subsequent ones, and Messenger had no anomaly. This on-again off-again nature of the anomaly is a bit strange. There seems to be a slight correlation to the orientation of a flyby relative to the Earth’s equator and the appearance of the anomaly. This may be an indication that the anomaly is somehow related to the rotation of the Earth, though studies of relativistic frame dragging on the probes show that effect isn’t enough to account for the anomaly. Another explanation for the anomalies is an effect known as the transverse Doppler effect. This effect occurs when an object is only moving side to side (transverse) relative to you, not toward you or away from you. Normally the transverse Doppler effect is too small to worry about, but for a close flyby it becomes important. While the transverse Doppler effect can account for the Doppler anomaly, it can’t account for the time-of-flight ranging data that is also observed in some cases. Since standard physics can’t seem to account for the anomaly, wilder ideas have been proposed, such as modified gravity theories, a dark matter halo surrounding Earth, even a quantum gravity process known as the Hubble scale Casimir effect. Of course explaining the anomaly after the fact isn’t enough to give these wild ideas credence. What they need to be able to do is predict a flyby anomaly, which no one has been able to do yet. A similar anomaly was seen with the Pioneer probes, with Pioneer 10 and 11 slowing down a bit faster than expected (equivalent to an acceleration of ten billionths of a gee too small). When no clear solution could be found in traditional physics all sorts of exotic physics ideas were proposed to account for the Pioneer anomaly. In the end it turned out to be a very subtle effect of thermal recoil from their power sources. The most likely explanation for the flyby anomaly is some subtle but mundane effect we just haven’t pinned down. But there is always a chance that it is due to something more exotic. The effect is definitely there, so it is worth exploring each time there is a close flyby. The closer one measures an effect the more likely an error or miscalculation will occur. Ten kilometers per second to the closest meter, good enough. Measurements off by millimeters thus micrometers, nanometers and Planck lengths when compared to cosmic scales looses any significant meaning unless one wishes to calculate a position millions or billions of years in the future. Yesterday a new gravity map of the Earth’s ocean bottoms was published. Slight variations in the strength of gravity allow such mapping. The mystery of the missing or added millimeters may have an answer by looking at which part of the Earth the flyby flew by. Detailed explanation to within the same percentage precision as the thermal recoil account for the Pioneer anomaly has been given in https://iopscience.iop.org/0295-5075/110/5/54001/article . Radar residuals of hundreds of metres initially reported with the NEAR flyby and similar range data discrepancy in Rosetta 2009 flyby, which have been ignored by both physicists and science media in discussing the anomaly, are explained for the first time and shown equivalent to the anomalous “Delta-V”. Significantly, the radar residuals are shown to imply a whole class of solutions to the wave equation that are orthogonal to – hence not represented by – sinusoidal waveforms. These solutions had not been considered for 250 years since Euler and Bernoulli came up with the sinusoidal solutions, and no one had looked back to check if the latter were indeed most general, which couldn’t be because the sinusoidal solutions are constrained solutions, constraint being the premise of constant frequencies typically invoked in the separation of variables.